\r\nBorgo Panigale, Bologna, 8 January 2019 – Ducati continues its safety-focused research by taking part - together with Audi and Ford - in the first US demonstration of a communication system that interlinks vehicles, street infrastructure and pedestrians. \r\nThis test follows the one completed in Germany last July. The latter saw the ConVeX (Connected Vehicle to Everything) project - a key part of Ducati\'s “Safety Road Map 2025” strategy which aims to develop new safety systems and technologies - showcased in Europe for the very first time. The initial stages of this strategy will see ABS Cornering extended to the entire Ducati range and the market launch, in 2020, of a bike with front and rear radar. \r\nDucati, Audi AG (NASDAQ: AUDVF), Ford Motor Company (NYSE: F), and Qualcomm Technologies, Inc., a subsidiary of Qualcomm Incorporated (NASDAQ: QCOM), announced the companies’ continued joint efforts to help accelerate commercial deployment for C-V2X direct communication technology for roadside safety, traffic efficiency and automated driving. As a part of the Consumer Electronic Show® 2019 (CES 2019), a Ducati Multistrada 1260 as well as Audi and Ford vehicles, demonstrate driving situations utilizing C-V2X direct communications. All vehicles were equipped with C-V2X technology utilizing the Qualcomm® 9150 C-V2X chipset to demonstrate a cooperative intersection use case, exhibiting how C-V2X can be used between vehicles to negotiate the right of way in entering a four-way, non-signalized intersection where intention sharing and non-line-of-sight (NLOS) conditions make the use of a wireless sensor such as C-V2X ideal. \r\nThe companies also exhibited additional Vehicle-to-Vehicle (V2V), Vehicle-to-Pedestrian (V2P) and Vehicle-to-Infrastructure (V2I) safety scenarios, demonstrating the maturity and potential of C-V2X technology. The V2V use case featured the Intersection Movement Assist (IMA) scenario, which is a key countermeasure to address angle collisions at intersections, while the V2P scenario exhibited how C-V2X can be used to protect vulnerable road users, including pedestrians and bicyclists. The V2I use case featured the Work Zone Warning scenario, which is designed to provide drivers advanced warning of road construction ahead allowing them to maneuver in a safe manner. \r\nThis week’s Las Vegas demonstrations follow the successful showings of C-V2X trial validations and interoperability conducted throughout 2018 in Europe, Japan, Australia, China and the United States, as well as the first live C-V2X interoperability demonstration between a motorcycle, vehicles and roadside infrastructure, which was hosted by several leading automotive and technology companies, including Ducati and Qualcomm Technologies. \r\nDucati, Audi, and Ford are amongst several global automakers who have closely evaluated C-V2X technology for its reliability, high-performance capabilities and readiness through rigorous testing. Currently, C-V2X is the only V2X alternative that provides a clear evolution path to 5G, in a backward compatible manner, and is designed to deliver reliable and consistent performance in realistic driving scenarios. While complementing other Advanced Driver Assistance System (ADAS) sensors, such as radar, lidar, and camera systems, C-V2X direct communications supports an ever-expanding set of safety use cases, as well as enhanced situational awareness by detecting and directly exchanging vital information. Additionally, C-V2X is designed with a focus on security, benefitting from established security transport layers and application protocols defined by the automotive standards communities, including ISO, ETSI and IEEE 1609. Because C-V2X can be easily integrated into all wireless modems to offer direct and network communications, its implementation is cost-effective, which is especially important as the automotive industry continues to move towards adding wireless connectivity in all vehicles. \r\n“This demonstration is showing use cases in which advanced technologies can significantly improve the safety of motorcycle users,” said Pierluigi Zampieri, Vehicle Innovation Manager at Ducati Motor Holding. “C-V2X communication is one of the key projects of the Ducati 2025 safety road map. There’s no better place than CES to talk about our roadmap towards the future”. \r\n“Audi has demonstrated a novel C-V2X use case together with Ford, Ducati and Qualcomm Technologies. The four-way stop use case provides a glimpse of how cooperative driving will be possible with C-V2X in the future. Besides additional safety, C-V2X is designed to also improve comfort and efficiency, which can be applied to both current and future autonomous driving,” said Anupam Malhotra, Director, Connected Vehicles & Data at Audi of America, Inc. “Audi has demonstrated commercial viability of cellular-based V2X services through the Audi Traffic Light Information service and plays a leading role within the 5GAA to develop this technology further”. \r\n“Imagine a person suddenly steps into the street from out of view and your vehicle stops because it was alerted by that person’s smartphone. This is just one example of how C-V2X can connect smart vehicles to a smart world,” said Don Butler, executive director, Ford Connected Vehicle Platform and Product. “We invite other automakers, governments and tech companies to join the significant momentum building for a C-V2X ecosystem”. \r\n“As part of Qualcomm Technologies’ ongoing work with Ford, Audi and Ducati, we are excited to continue strengthening our mutual efforts towards accelerating C-V2X’s commercial deployment. This new chapter in our longstanding relationships outlines our collective goal to realize the full potential of C-V2X as a global solution for next-generation vehicle connectivity, safety and autonomy,” said Nakul Duggal, senior vice president of product management, Qualcomm Technologies. “We look forward to showcasing the latest results of this relationship as several Ford, Audi and Ducati vehicles demonstrate C-V2X interoperability in real-world driving situations”. \r\nThe demonstration by Ducati, Audi, Ford, and Qualcomm Technologies will be conducted live in Las Vegas by appointment and will also be livestreamed at Qualcomm Technologies’ automotive booth in the North Hall (booth #5609), and in the Central Hall (booth #TBD) throughout the show. The demonstration will also be shown in the Audi and Ford booths. Borgo Panigale, Bologna, 8 January 2019 – Ducati continues its safety-focused research by taking part - together with Audi and Ford - in the first US demonstration of a communication system that interlinks vehicles, street infrastructure and pedestrians. This test follows the one completed in Germany last July. 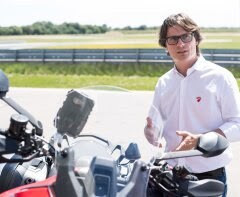 The latter saw the ConVeX (Connected Vehicle to Everything) project - a key part of Ducati's “Safety Road Map 2025” strategy which aims to develop new safety systems and technologies - showcased in Europe for the very first time. The initial stages of this strategy will see ABS Cornering extended to the entire Ducati range and the market launch, in 2020, of a bike with front and rear radar. 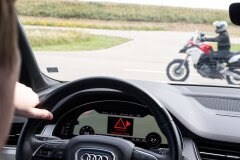 Ducati, Audi AG (NASDAQ: AUDVF), Ford Motor Company (NYSE: F), and Qualcomm Technologies, Inc., a subsidiary of Qualcomm Incorporated (NASDAQ: QCOM), announced the companies’ continued joint efforts to help accelerate commercial deployment for C-V2X direct communication technology for roadside safety, traffic efficiency and automated driving. 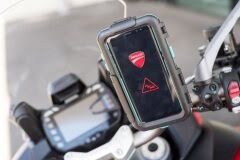 As a part of the Consumer Electronic Show® 2019 (CES 2019), a Ducati Multistrada 1260 as well as Audi and Ford vehicles, demonstrate driving situations utilizing C-V2X direct communications. All vehicles were equipped with C-V2X technology utilizing the Qualcomm® 9150 C-V2X chipset to demonstrate a cooperative intersection use case, exhibiting how C-V2X can be used between vehicles to negotiate the right of way in entering a four-way, non-signalized intersection where intention sharing and non-line-of-sight (NLOS) conditions make the use of a wireless sensor such as C-V2X ideal. The companies also exhibited additional Vehicle-to-Vehicle (V2V), Vehicle-to-Pedestrian (V2P) and Vehicle-to-Infrastructure (V2I) safety scenarios, demonstrating the maturity and potential of C-V2X technology. The V2V use case featured the Intersection Movement Assist (IMA) scenario, which is a key countermeasure to address angle collisions at intersections, while the V2P scenario exhibited how C-V2X can be used to protect vulnerable road users, including pedestrians and bicyclists. The V2I use case featured the Work Zone Warning scenario, which is designed to provide drivers advanced warning of road construction ahead allowing them to maneuver in a safe manner. This week’s Las Vegas demonstrations follow the successful showings of C-V2X trial validations and interoperability conducted throughout 2018 in Europe, Japan, Australia, China and the United States, as well as the first live C-V2X interoperability demonstration between a motorcycle, vehicles and roadside infrastructure, which was hosted by several leading automotive and technology companies, including Ducati and Qualcomm Technologies. Ducati, Audi, and Ford are amongst several global automakers who have closely evaluated C-V2X technology for its reliability, high-performance capabilities and readiness through rigorous testing. Currently, C-V2X is the only V2X alternative that provides a clear evolution path to 5G, in a backward compatible manner, and is designed to deliver reliable and consistent performance in realistic driving scenarios. While complementing other Advanced Driver Assistance System (ADAS) sensors, such as radar, lidar, and camera systems, C-V2X direct communications supports an ever-expanding set of safety use cases, as well as enhanced situational awareness by detecting and directly exchanging vital information. Additionally, C-V2X is designed with a focus on security, benefitting from established security transport layers and application protocols defined by the automotive standards communities, including ISO, ETSI and IEEE 1609. Because C-V2X can be easily integrated into all wireless modems to offer direct and network communications, its implementation is cost-effective, which is especially important as the automotive industry continues to move towards adding wireless connectivity in all vehicles. “This demonstration is showing use cases in which advanced technologies can significantly improve the safety of motorcycle users,” said Pierluigi Zampieri, Vehicle Innovation Manager at Ducati Motor Holding. “C-V2X communication is one of the key projects of the Ducati 2025 safety road map. There’s no better place than CES to talk about our roadmap towards the future”. “Audi has demonstrated a novel C-V2X use case together with Ford, Ducati and Qualcomm Technologies. The four-way stop use case provides a glimpse of how cooperative driving will be possible with C-V2X in the future. Besides additional safety, C-V2X is designed to also improve comfort and efficiency, which can be applied to both current and future autonomous driving,” said Anupam Malhotra, Director, Connected Vehicles & Data at Audi of America, Inc. “Audi has demonstrated commercial viability of cellular-based V2X services through the Audi Traffic Light Information service and plays a leading role within the 5GAA to develop this technology further”. “Imagine a person suddenly steps into the street from out of view and your vehicle stops because it was alerted by that person’s smartphone. This is just one example of how C-V2X can connect smart vehicles to a smart world,” said Don Butler, executive director, Ford Connected Vehicle Platform and Product. “We invite other automakers, governments and tech companies to join the significant momentum building for a C-V2X ecosystem”. “As part of Qualcomm Technologies’ ongoing work with Ford, Audi and Ducati, we are excited to continue strengthening our mutual efforts towards accelerating C-V2X’s commercial deployment. This new chapter in our longstanding relationships outlines our collective goal to realize the full potential of C-V2X as a global solution for next-generation vehicle connectivity, safety and autonomy,” said Nakul Duggal, senior vice president of product management, Qualcomm Technologies. “We look forward to showcasing the latest results of this relationship as several Ford, Audi and Ducati vehicles demonstrate C-V2X interoperability in real-world driving situations”. The demonstration by Ducati, Audi, Ford, and Qualcomm Technologies will be conducted live in Las Vegas by appointment and will also be livestreamed at Qualcomm Technologies’ automotive booth in the North Hall (booth #5609), and in the Central Hall (booth #TBD) throughout the show. The demonstration will also be shown in the Audi and Ford booths.